ClotCare Online Resource provides information only. This site does not provide medical advice. We do not recommend changes in your healthcare regimen. Moreover, you should consult with your healthcare provider before making any changes in your healthcare regimen. The information provided on ClotCare is designed to support, not replace, the relationship that exists between a patient/site visitor and and his/her healthcare professional(s). We hope that the resources available on ClotCare will facilitate communication between patients and caregivers. In using this website, you acknowledge and accept that this site is for informational purposes only. ClotCare Online Resource is a free service. You may access all areas of the site free of charge. Printing information from this site for personal or educational use is permitted, but reproduction of any of the site's content for use in another website or for commercial purposes is not authorized. Other websites are welcome to link to ClotCare Online Resource. From time to time, ClotCare Online Resource may request personal information from you. We do so in an effort to make the site more specific and useful to you. You are not required to provide us with personal information but may do so voluntarily. ClotCare Online Resource makes every effort to protect your personal information. Whenever we collect information from you via the ClotCare website, we do so via a secure connection (using SSL). Please note that we use a third-party solution for managing our email list, and SSL is not used on the email signup form. However, we keep your email address and personal information private (i.e. we do not share your personal information with anyone). Please use your own judgment when sending information to us via email. Email communication is not always secure. Summary or aggregate information, such as the background and training of visitors to the site, may be shared with existing and potential supporters in securing continued funding for the site. In addition to securing your personal information as described above, we respect your privacy by never providing your personal information to third parties. 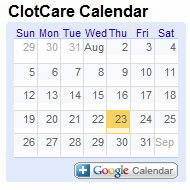 ClotCare Online Resource may provide links to other websites that we feel may be of interest or of use to you. A link to another site from ClotCare Online Resource does not constitute an endorsement by ClotCare of the third-party site. Further, ClotCare Online Resource has no control over the content, terms and conditions of use, and/or the privacy practices of third-party sites to which it links. Many of the images on ClotCare Online Resource have been provided by third-parties who own the copyrights to the images. In the interest of protecting the copyrights of the third-parties who provide images to ClotCare, we ask that you do not reproduce, copy, or modify the images on ClotCare Online Resource in any way without prior written permission. If you would like to obtain permission to use an image from ClotCare, please contact us at webmaster@clotcare.com. If an image is displayed with information concerning its source, you may click on the image to be taken to the website from which the image was obtained. If you have any questions concerning these policies, please contact us at webmaster@clotcare.com.